This simple page was created to give those planning a trip to Whitby during our dive season some information that falls outside of planning the actual dives themselves. Unfortunately there is no longer a true dive centre or dedicated diving charter boat in Whitby. Given the proximity to such a bounty of wonderful wrecks it is such a shame that there is no centre. I know from experience how difficult it is to please the diving fraternity and the dive shows pretty much made it so very difficult for small businesses who simply could not compete with the dive show prices. As divers our eagerness to get the lowest price didn't really work and many businesses ultimately failed. There are still charter boats in Whitby who might be willing to charter for divers as opposed to fishing, if I can find any I will add their contact details her, in the meantime if anyone knows of any facilities please let me know. It is not unusual for people to be seen working away on a mobile telephone, of course today mobile telephones are so prolific that it is those without one that stand out more. With adverts all over the media it seems there are apps for just about everything. 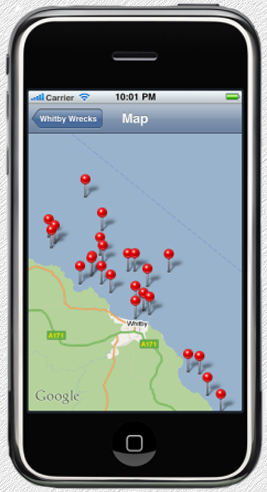 It is with pleasure that I introduce a new app which covers many of the wreck positions and details off this part of the coastline. If you have a compatible phone there are more details about the app which can be downloaded free here. This information will be of interest to Divers, Anglers, and Boat Owners in the Whitby area. Here is the Met Office weather forecast for Whitby during the next five days. If you require some local tidal data then please follow this link to access thecurrent online tidal data. Please note the following tidal differences apply to destinations north and south of Whitby and are corrected for British Summer Time. Note:- Tidal differences before and after Whitby.